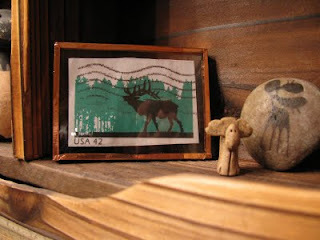 I really like moose (and dragonflies), and I got a letter with this stamp of a moose on it one day. 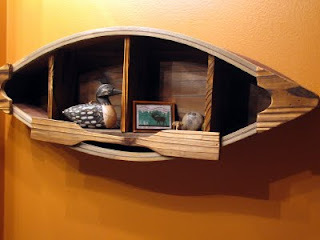 I tore it off and had it in a row boat shelf in the bathroom. Every once in a while, it would blow off into the sink. I have been afraid it would get ruined. I kept seeing soldered charms with various pictures in them and decided to frame my moose stamp that way to protect it and give it more substance. After I had cut the glass and foiled it, I decided not to solder. I think the copper look is better than silver or black for where I have it ,and I don' t have much luck getting my solder to look coppery even with the correct chemical stuff. And besides, I can always solder later if I decide to. I love this, and it's a great little reminder. 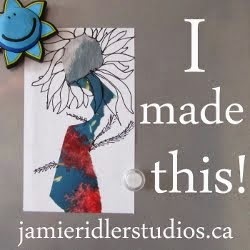 what a fabulous way to display the stamp!! very cool. and thanks for popping over to my place. i appreciate your encouragement. What a nice addition to your little vignette.